Odd Bird Planet is arriving at the Paper Garden Projects store! I'm so excited to finally start offering some of the great Odd Bird Planet images. The first offering is a set of my favorite Odd Bird Planet Halloween images. The set is cling mounted with the images indexed on the cling so you can see where you are stamping. 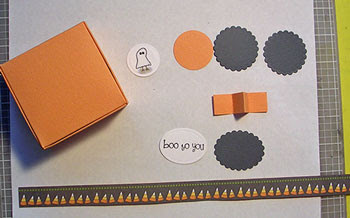 The set includes Witch Shoes, Ghost Bird, Thersa's Spider, Kelly's Web and Boo To You, all packaged in a CD case for storage. You can see the set HERE. I thought I'd share a couple projects I made with this super cute set. 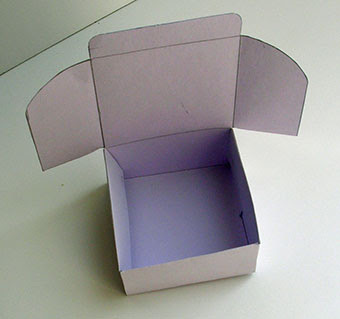 I created a template for the box. Its like a tiny doughnut box. You can download a PDF for the template at Splitcoast Stampers in this thread HERE. 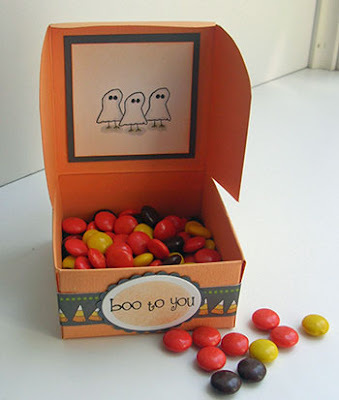 Of course Candy Corn is good too... and the box holds plenty. 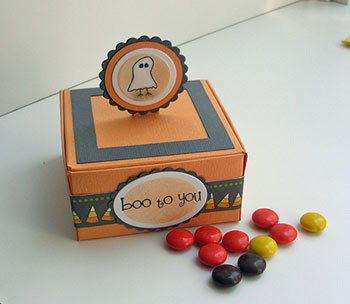 I made this little box using Ghost Bird (too cute! - love the little birdie feet). 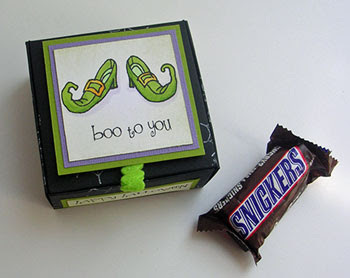 The image is mounted on a tab and can be used as a handle to open the box. 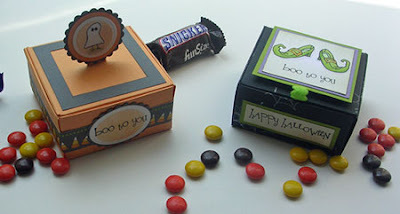 I also added a 12" strip of patterned paper around the sides of the box. 12" will not be quite long enough to go all the way around the box, but the gap will be hidden by the sentiment on the front. 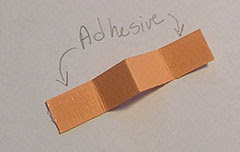 To create the tab to mount the image on, cut a 1/2" strip 2" long and fold as shown. Put adhesive on the top of the two side "wings". 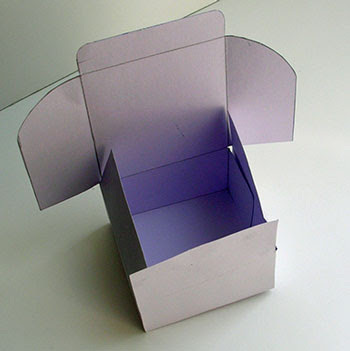 Cut a slit in the lid of the box and feed the folded piece through, adhering the "wings" to the underside of the lid. 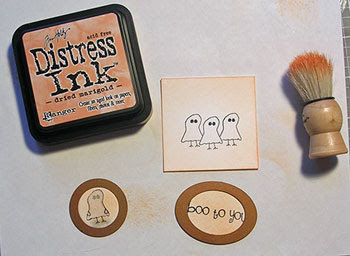 I wanted to cover the tab "wings" on my inside lid, so I created a 2 1/4" square Ghost Bird trio. Since I was just inking the very edges with the Duster Brush - I didn't bother masking. Then - I just assembled my box. 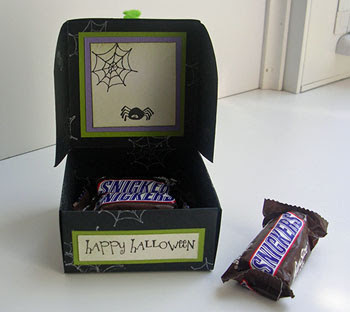 Here is a picture of the box open. 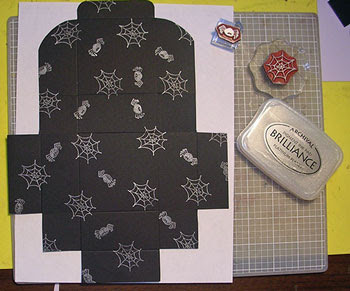 Before I assembled the box, I randomly stamped Kelly's Spiderweb and Thersa's Spider in Brilliance Platinum Planet ink. Look how well is shows up on black - its one of my favorite Brilliance inks. Those are all wonderful. How cool that you're selling OBP stamps!